From the Orlando Sentinel, a reader writes with a question regarding hard surface flooring restrictions in the Miami area. However, this question and answers applies to everybody living in multi-family units. Richard White answers this question, "There is no good answer, except do not allow any hard flooring to be installed in upper-floor units." 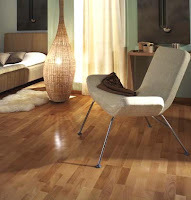 He goes onto say that one should contact a flooring professional. The problem is that a hard wood surface floor that is properly installed is still going to transmit noise to the neighbors below, it is very difficult for your neighbor to soundproof against this. The will result in problems including the "devaluation" of the unit below. So Richard White's recommendation is not to allow hard surface flooring to be installed in upper units.